One of the biggest dreams I have, is to one day own a home that has enough outdoor space that I can have a lovely fruit, veggie, and herb garden. Goodness gracious would that just make me the happiest girl in all the land. There's something so romantic and life freshening about walking outside into the sunshine or setting sun, getting your hands dirty, and planting and harvesting food for your family. I was fortunate enough to watch my grandparents do it a bit when I was younger. I remember walking down with them with wicker baskets in hand, and picking vine ripened, warm from the sun cherry tomatoes (and munching on a few right then and there!) Such an amazing feeling :) and that memory is one of my most vivid memories to date! Corn, string beans, onions, tomatoes for days, bell peppers, apples, oranges, lemons, rhubarb- I mean they grew so much lovely stuff! The flavor of homegrown produce is really like no other. One day hopefully, I'll be able to do the same thing with my family. Until then though, our little Los Angeles apartment patio is bursting at the seams with as much potted stuff as I can grow. So far, we've got chives, rosemary, tomatoes, poblanos, and jalapeños (oh and succulents). Wheeeeeee! A friend of ours though, has a much larger garden- one that's multi-tiered and just the most fantastic thing you've ever laid eyes on. One Saturday afternoon, we were invited to come by and share in the summer harvest! Full permission to rummage through their growing yum yums and grab as much stuff as we wanted! Ummm, what? YES PLEASE! 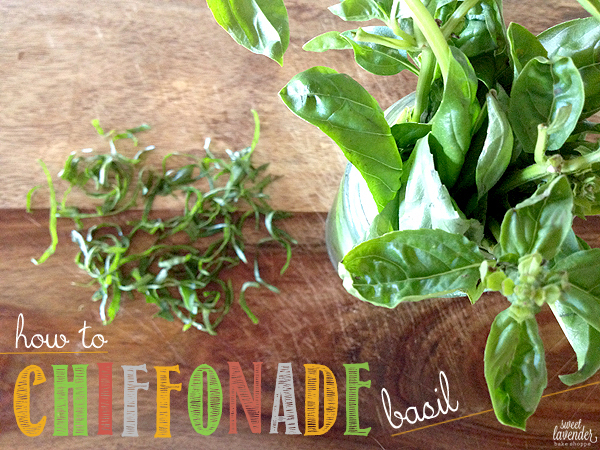 I don't know about you, but basil is my FAVORITE herb around. I'm always so sad when the summer season comes to an end and my basil plants wither away. I wish that darned thing grew all year round! Another reason to love the summer, I guess! When basil is flourishing though, I tend to go crazy and use it on EVERYTHING. I mean, everything. It makes it's way into breakfast, lunch and dinner, I swear! Just can't get enough. When the season starts to come to an end, I usually end up grabbing and saving as many of the leaves as I possibly can before the plant gives up producing, and I make jars of pesto (you know, to really extend the basil-palooza I have going on). MmMmMmmmm pesto! Here's a fantastic and fancy-smancy way you might want to try cutting your basil leaves so that your slaved over dinner or caprese salad looks like a 5-Star plated dish ;) Chiffonade! Pronounced "shif-o-nod". 1. 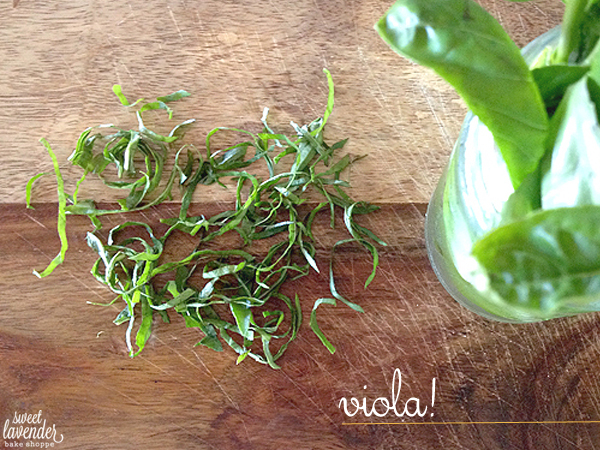 Grab a few fresh, cleaned and dried leaves- the bigger, the easier it will be for you to chiffonade later. I'd like to note here that a great way to store picked basil stems with leaves, is to place the stems in a jar of water (like you'd store flowers in a vase), and store in fridge. Leaves will stay fresh and crisp for a few days after being plucked. Then, just pluck leaves off of stems as you need. 2. From largest leaf to smallest, stack one on top of another. 3. Once all the leaves you're using are stacked, roll your pile as tight as you can. Doesn't matter which way you roll (top to bottom or left to right), it will only produce longer chiffonaded strips or shorter. 4. 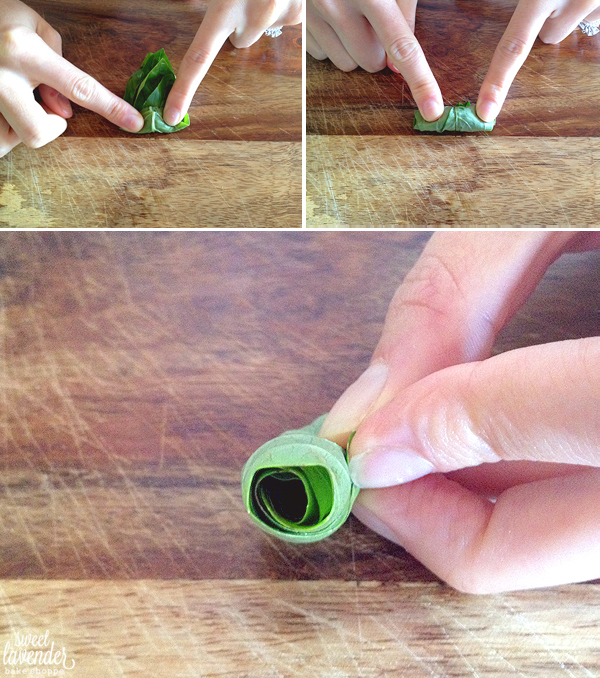 Then, while holding the rolled basil leaves securely on a cutting board with one hand, cut through your roll as thinly as you possibly can. 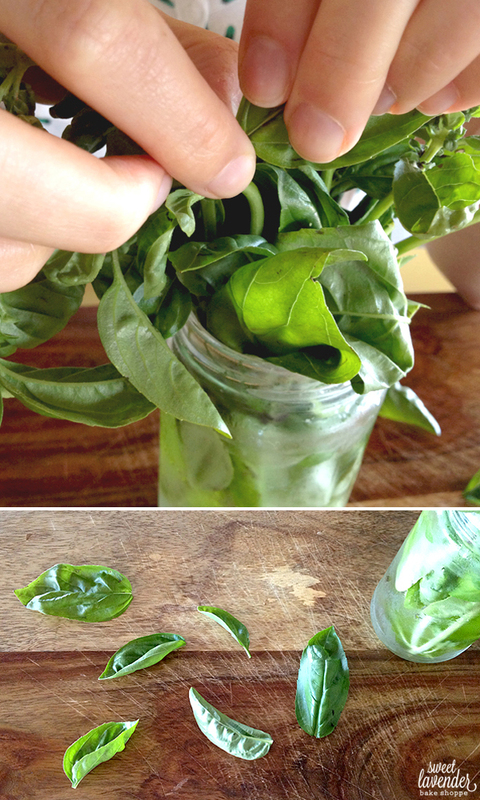 A sharp knife is crucial for this as it will cut through the leaves instead of bruising and squishing. Don't have one? Use a very finely serrated blade as well. Continue until you've cut through your entire roll!